If you wish to impress someone special, they also make a perfect choice. Four layers – 4 fantastic tastes make a perfect match. Crunchy layer made of graham crackers, then chocolate cheesecake layer, peanut butter and chocolate topping to finish with. Yummy! 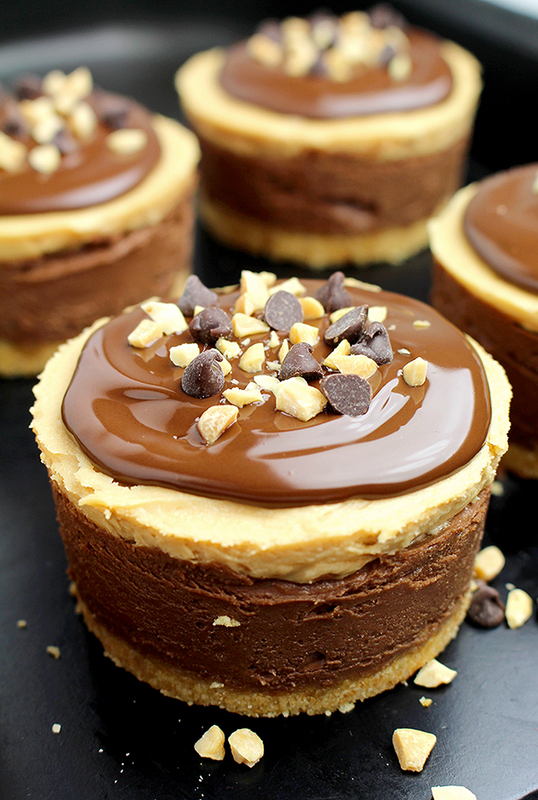 My family loves the taste of this fabulous Chocolate Peanut Butter Mini Cheesecake. What I also like about them is that they look great and are very easy to prepare. My little son can hardly wait for me to finish making it, waiting for the dish with the chocolate leftover. It is the sweetest part of making desserts, for him. 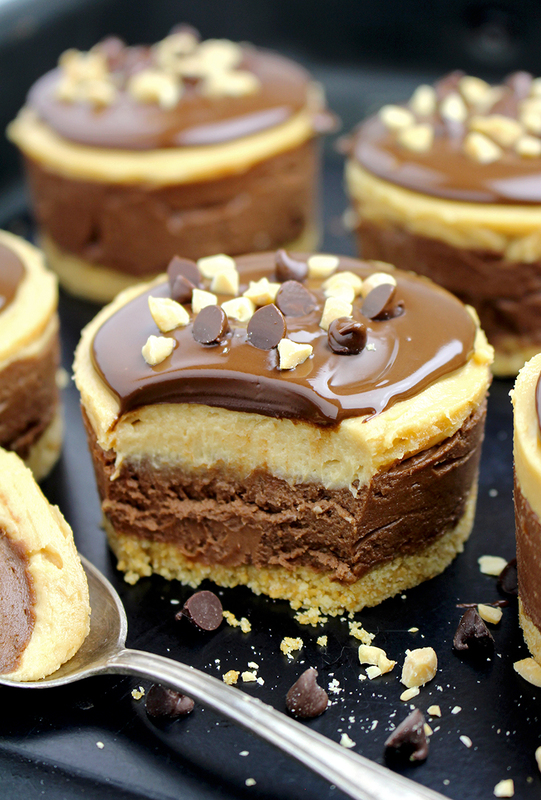 Chocolate Peanut Butter Mini Cheesecake perfect dessert recipe for a complete pleasure. Something I am sure everyone would like to experience! They are perfect for special occasions; they look great and taste even better ? 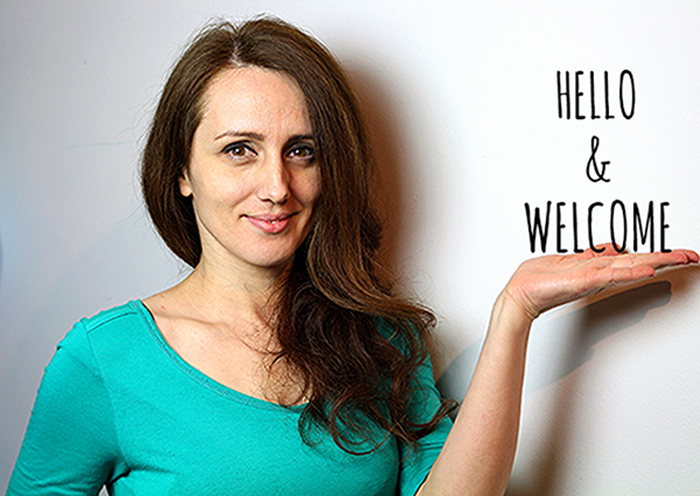 We all enjoy making it, my son enjoys chocolate, and I enjoy decorating cheesecake and my husband… simply watching us. Make a surprise for the people you love, for your friends and family, prepare Chocolate Peanut Butter Mini Cheesecake and enjoy it together. 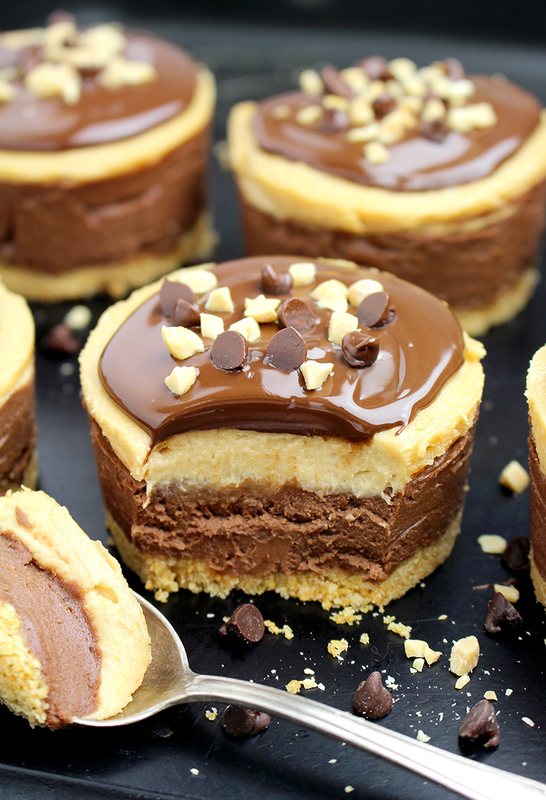 What do you need to make this Chocolate Peanut Butter Mini Cheesecake? Gorgeous combo of Graham Crackers Crumbs, Chocolate and Peanut Butter incorporated in these mini cheesecake form for delicious moist and tasty homemade dessert. We are a real fun of cheesecake recipes. You can take a look most popular cheesecake creations on our blog No Bake Strawberry Cheesecake, Easy No Bake Oreo Mint Cheesecake and No Bake Layered Chocolate Mini Cheesecake. 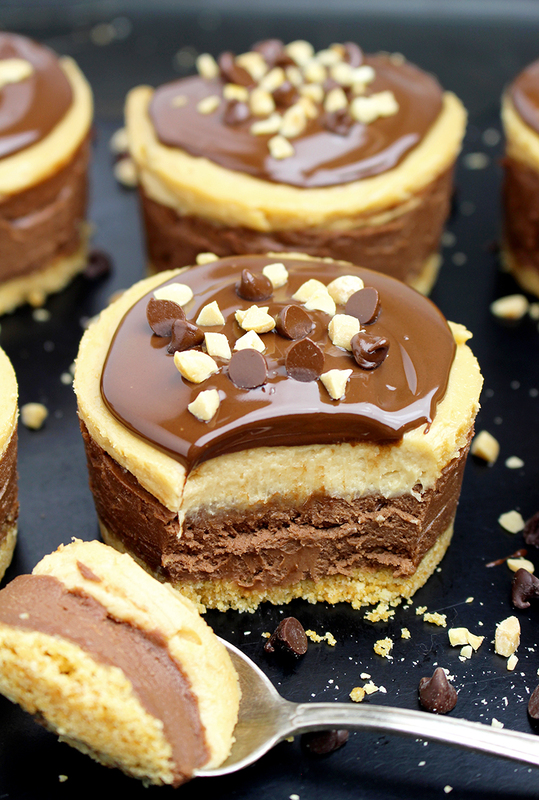 How to make this Incredible Chocolate Peanut Butter Mini Cheesecake? GRAHAM CRACKERS CRUST – Prepare 12 larger paper baking cups (I used 2.55 inch diameter and 2.15 inch height) or mini springform pan. Put graham crackers in the food processor until they are crumbed finely. Add melted butter and stir well. Spread evenly in the paper baking cups and press with a solid object, like a glass to make solid layer. Set aside. CHOCOLATE CHEESECAKE FILLING – Melt chocolate following the instructions on the package. Add heavy cream and mix well. Set aside. In a medium sized dish mix cream cheese and powdered sugar with an electric hand mixer, at a minimum speed, for about a minute. Add vanilla extract and melted chocolate and mix until well combined. Spread evenly over the graham cracker layer, with a spoon. Leave it in the fridge to cool. PEANUT BUTTER CHEESECAKE FILLING – In a medium sized dish mix cream cheese and powdered sugar with an electric mixer at a minimum speed, add vanilla extract, peanut butter and heavy cream. Mix until you get fine, smooth mixture. Take the cheesecake out of the fridge and spread evenly over chocolate cheesecake filling. Put it in the fridge. CHOCOLATE TOPPING – Melt chocolate following the instructions on the package. Add heavy cream and oil and stir well. Take the cheesecake out of the fridge. Pour chocolate topping over the cheesecake with a spoon. Sprinkle with chopped peanuts and mini chocolate chips. I used larger paper baking cups 2.55 inch diameter and 2.15 inch height and made 12 mini cheesecakes. Mini springform pan is similar to mold for muffins, just the bottom can be moved up and therefore mini cheesecake can be pull out. GRAHAM CRACKERS CRUST - Prepare 12 larger paper baking cups (I used 2.55 inch diameter and 2.15 inch height) or mini springform pan. Put graham crackers in the food processor until they are crumbed finely. Add melted butter and stir well. Spread evenly in the paper baking cups and press with a solid object, like a glass to make solid layer. Set aside. CHOCOLATE CHEESECAKE FILLING - Melt chocolate following the instructions on the package. Add heavy cream and mix well. Set aside. In a medium sized dish mix cream cheese and powdered sugar with an electric hand mixer, at a minimum speed, for about a minute. Add vanilla extract and melted chocolate and mix until well combined. Spread evenly over the graham cracker layer, with a spoon. PEANUT BUTTER CHEESECAKE FILLING - In a medium sized dish mix cream cheese and powdered sugar with an electric mixer at a minimum speed, add vanilla extract, peanut butter and heavy cream. Mix until you get fine, smooth mixture. Take the cheesecake out of the fridge and spread evenly over chocolate cheesecake filling. CHOCOLATE TOPPING - Melt chocolate following the instructions on the package. Add heavy cream and oil and stir well. Take the cheesecake out of the fridge. Pour chocolate topping over the cheesecake with a spoon. 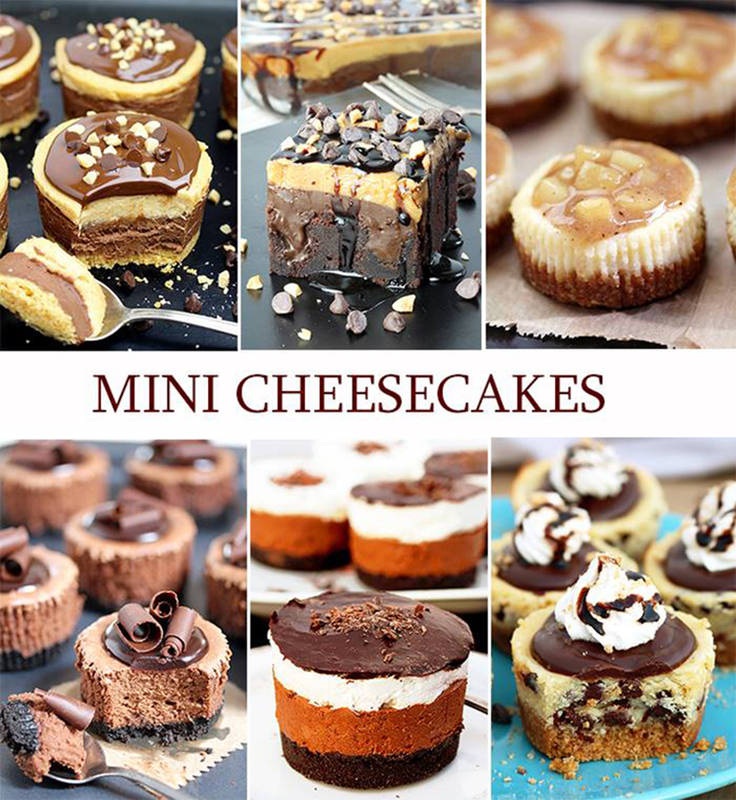 Is it easy to remove the baking cup and get a nice looking mini cheesecake? Thanks. Yes Mama Joe, just gently tear paper baking cups. Did you use a large muffin pan with the liners or did you use the mini cheesecake pan? I used 12 larger paper baking cups (2.55 inch diameter and 2.15 inch height). What is a mini cheesecake pan?? It`s similar to mold for muffins, just the bottom can be moved up and therefore mini cheesecake can be pulled out. Would it be good to use silicon molds too? How many cheesecake does this recipe make? I used paper baking cups 2.55 inch diameter and 2.15 inch height and made 12 cheesecakes. I did not use silicon molds but I suppose it would be OK.
You use baking chocolate not chocolate chips in the recipe right? Yes, semi – sweet chopped chocolate for cheesecake filling and topping. So I made these cheesecakes today using a mini cheesecake pan. There is a lot of chocolate layer mix left over. 12oz of chocolate, compared to 4oz for peanut better, seems like an lot. Likewise, 6 oz of chocolate for the topping is a whole lot too. Hi Kim, thank you for your opinion. I used 10 ounces semi – sweet chopped chocolate in chocolate cheesecake filling. Also, I used larger paper baking cups 2.55 inch diameter and 2.15 inch height and made 12 cheesecakes. But certainly you can adjust the amount of ingredients to taste. It should be fine if you use 9-inch springform pan. Can you use semi sweet chocolate chips instead of chopped chocolate? These look fabulous. How can I focus on work now…lol! Oh man I’m in trouble. I’m going to have to drop everything and make these right now! They look AMAZING! Thanks for the recipe! I made these and I made them in muffin cups but my chocolate layer did not set and I had lots left over the 12 it was supposed to make. They are tasty though. i`m so glad you like it 🙂 I used larger paper baking cups 2.55 inch diameter and 2.15 inch height and made 12 cheesecakes. I have never seen Graham biscuits in NZ. Is there another biscuit l could use instead? You can try with digestive biscuits instead, just add some cinnamon. 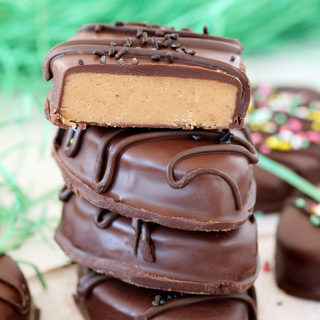 Great dessert, I love peanut butter and combination with cheesecake I can only imagine how delicious is. Thank you for sharing this amazing recipe. If I make them in regular muffin tins do I have to use paper cups? Will they stick to the pan if I don’t use paper cups? 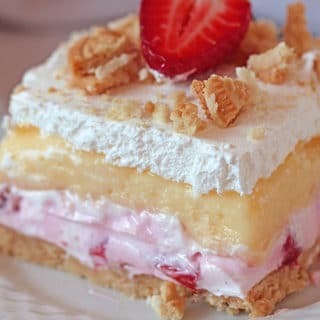 I just don’t want the paper to leave ridges in the dessert if I take the paper off for better presentation ..because yours in the picture look so nice.. Thanks, I`m glad you like it :-). I didn`t make it that way, but if you want to use only regular muffin tins you need to reduce the amount of ingredients for about 1/3. For nice look and presentation, it`s better to use paper cups. Hihi…looks delicious! !wanted to try this…however wanna try to do this in a jar wonder if it will set? I left it in the fridge to set for about 15 minutes. I was wondering after making these if I could freeze them for about a week ? I didn`t try, but I am sure mini cheesecake can be frozen up to one week if stored correctly. Hi can i ask if i done everything n u say fridge overnight is when all done right? Will it melt in room temp if i leave it for hours? Yes, finally leave it in the fridge overnight. It will not be so tight, if you leave it on room temperature. I made this in a small spring form pan and my only question is how easily does it separate from the sides of the pan? I’m just wondering if it will stick to the pan? You can line a pan with wax paper. 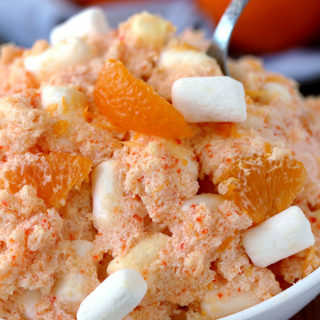 Want to try this recipe LOVE CHEESECAKE and this looks awesome. I was wondering can this be made on a 9×13 or other sized pan and served like that out of the refrigerator. Do you peel the paper cups off the mini cheese cakes before serving/for presentation? where do you get your paper baking cups? I have been looking on line can’t find em. WoW ! Looks so yummy, moist and soft. Thanks for sharing ! how long does the cheesecake need to chill before adding the next cheesecake level? Ranesha, you can refrigerate about half an hour or until firm.. before adding the next cheesecake filling.